SCORE Fox Cities is one of the most active SCORE chapters in the State of Wisconsin. We have a team of 40+ active mentors that provide support and mentor clients on an on-going basis. Our mentors are knowledgeable, motivated, dedicated and committed to helping small businesses. We manage SCORE Fox Cities, Oshkosh and Fond du Lac chapters. We represent 8 counties: Calumet, Green Lake, Fond du Lac, Marquette, Outagamie, Waupaca, Waushara, and Winnebago. We offer workshops, seminars and webinars throughout the year. Our newly introduced workshop, Simple Steps to Starting a Business (funded by Bank of America), includes Start-up Basics, Business Concept, Marketing Plans, Financial Projections and Funding Sources & Next steps for the client that is interested in understanding what it takes to be a business owner. While our main focus is to take care of the needs of our small business clients, we are are always looking for new volunteers that can help us with mentoring, support functions in the day-to-day operations of the organization as well as specialists who can offer their limited time and resources to guide or advice our clients on an ad hoc basis. SCORE is a valuable network of 13,000+ volunteers who offer small business entrepreneurs confidential business mentoring services at no charge. 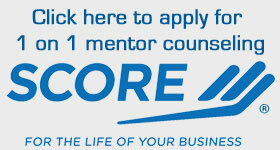 SCORE volunteers have the knowledge, expertise and experience to help any small business owner get the help they need. Our dedicated volunteers represent over 3,000 years of experience across 62 industries. SCORE also provides local workshops and events throughout the country to connect small business owners with the people and information they need to start, grow, and maintain their businesses, as well as online workshops available 24/7. SCORE provides resources, templates and tools to assist entrepreneurs in developing plans that they need to navigate their way to small business success.